Dayglow is ramping up for the massive The E.N.D. Tour Electronic Never Dies which will hit over 50 US cities in the next few months. 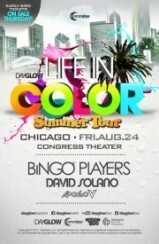 With top DJs set to rock Dayglow stages across the United States in the coming months, Dayglow (Life in Color) is ambitiously attempting to take the touring concept to a whole new level.